For the second of two days in Yosemite, my cousin Don was looking for a hike that would give us great views of one of the Valley's waterfalls, which were flowing strongly in early June following an El Nino winter. I really didn't want to hike the Vernal/Nevada Falls Mist Trail with summer crowds so I left that one off the table. We ended up hiking the Yosemite Falls Trail to Yosemite Point, possibly my second least favorite hike in the Valley, also entirely due to its high popularity. We were up around 7a from our rustic Housekeeping Camp site, a side trip to Half Dome Village for coffee, and then to the TH parking across from Camp 4 where we started around 7:45a. The morning line for campsites was about 50 deep on a Wednesday, another fun Yosemite tradition I'm unlikely to participate in. I think I'd rather stand under the Glacier Point firefall - at least that would keep me on my toes. We spent about two hours climbing to the top of the trail where it goes over Yosemite Creek at a bridge. There were probably a dozen parties we passed by on the way up and several backpacking one on the way down. We stopped at Columbia Rock for pictures and other places, too, as we neared the falls and their cooling spray that would be most welcome in the afternoon heat. 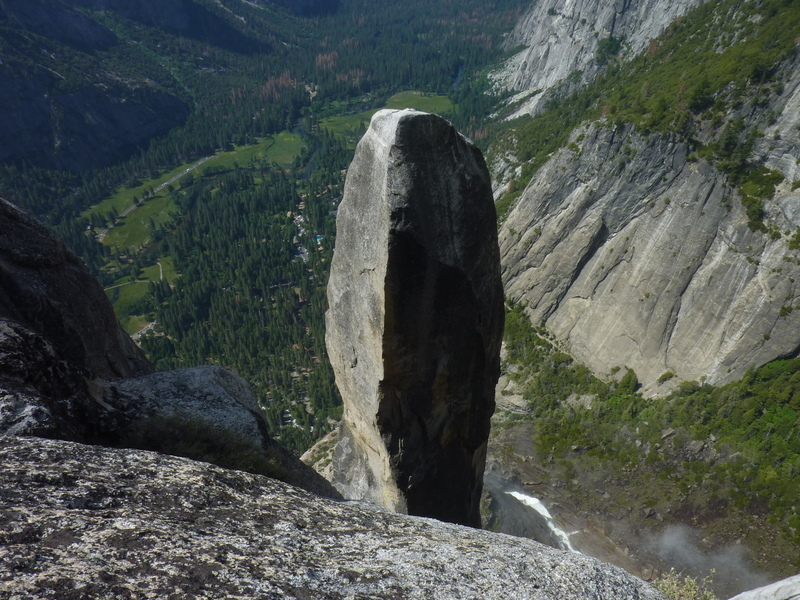 It was 10:15a when we reached our highpoint at Yosemite Point where another party was taking in the fine views. Looking right from here I spied the top of Lost Arrow. After Don had gotten his fill of the views I had him follow me west over slabs down to the closest point one can get to Lost Arrow, my first time with this imposing view. A woman was sitting in the shade of a tree about 100ft above us, reading a book. She had a coil of rope at her side and I guessed she might be waiting for someone to join her or for friends to finish a climb of Lost Arrow. Another rope could be seen dangling from a tree down the cliff towards the notch with Lost Arrow. But I never saw it move and couldn't tell if it was in use or simply left as a fixed line by a previous party. Having our fill of that scene, we continued our downward scramble towards Yosemite Creek to the west and then hiked upstream the short distance to the bridge and trail. Before starting down we paid a visit to the Yosemite Overlook, an interesting view spot on the west side of the creek. Stairs have been cut into the sides of the granite cliffs to reach a small overlook just west of the top of the falls from which one can get an impressive birdseye view. Interestingly, there was a set of half a dozen stainless hangers and eyebolts that have been installed for use in rapping down the length of the upper fall. I assume it is a pasttime practiced later in the summer when the volume of water is much lower. Now, that would be fun. After a few minutes' time we reclimbed the stairs and returned to the main trail. There were far more folks we went by on the way down, totalling in the hundreds. Now that it was nearer to noon, it was much warmer, making the ascent less pleasant, a fact written on the faces of many that we passed. "How much further?" was a common question asked in a somewhat pleading voice, in the hopes we could make things better. Don was very accomodating, cheerfully expressing, "You're almost there!" even when we had been descending for than half an hour. Despite the high traffic, or more likely because of it, the trail can be somewhat hazardous on the descent with a good deal of sand making the worn, rock steps sometimes slippery even in dry conditions. Don's pace began to slow considerably so I eventually went off ahead. I waited for about 20min at the trail's closest approach to the falls (where I could find shade and mist in a wonderfully refreshing combination), going ahead a second time when he caught up. My impatience caught up with me when I slipped on one of the sand-covered steps and took a forward dive down the trail. My left knee, the one I'm trying to rehabilitate, took a forceful stab into the trail as I went down. Thankfully it hit sand, not rock or I might have been far worse off. Still, my knee would not be so forgiving and let me know it did not appreciate such carelessness. Sprawled on the ground, I was slow to get up when a party I'd just passed going the other direction asked, "Are you alright?!" Sheepishly, I responded, "Yeah, I just haven't figured out how to walk on a trail yet..."